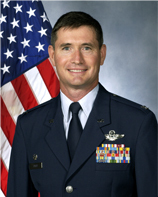 As the Air Force Reserve Officer Training Corps (ROTC) Commander at Purdue, I have the privilege of meeting many future students who are interested in serving their country. To help gain a perspective on their desires, I always ask about their family background. Last fall, a young man named Ian came into my office with his parents, Rick and Rita Hadley. The interview was normal until I asked what his parents did for a living. They both genuinely were excited at the question and proceeded to tell me all about their bronze art sculpture business in Otterbein, Indiana. Being a farm boy myself who grew up in that part of Indiana, I immediately generalized that they must be amateurs tinkering with the concept. However, the more I asked, the more they seemed like true professionals. I said that the next time I drove by Otterbein I would drop into their studio to see the operation. It was not long afterwards, while wearing my other hat as a faculty member assisting a group of student leaders, that the students decided on their project. 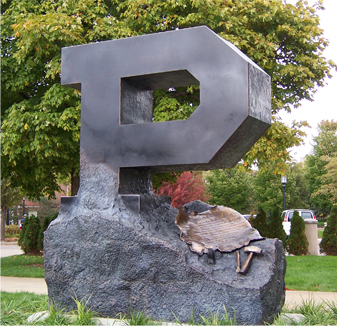 They initially wanted to have an Unfinished Purdue Block "P" carved from a large piece of granite. Two years ago, I was responsible for a $75 million breakwater project that was constructed mostly from large granite blocks. Based on my previous nightmares related to this breakwater project, this project idea just seemed like a "bridge too far" due to cost and challenges associated with granite blocks. Having been impressed by many of the sculptures around Purdue made from Bronze, I decided to contact Rick and Rita Hadley. They sent me their portfolio, which was absolutely overwhelming. They were NOT amateurs at all. I shared this electronic portfolio with a group of student leaders. They were sold immediately on the Hadley's capability and agreed that we should investigate this option further. Several of us visited their Otterbein studio the next week and were amazed by their past projects and many of their works in progress. I think what initially convinced the students to switch from granite to bronze was the professionalism and warmth of the Hadley's. Almost immediately at that first meeting, everyone began to bounce ideas off of each other—just like the old cliché, it was love at first sight. Now that the project has approval from Purdue to proceed, the relationship between the students and the Hadleys will get even more exciting. Hopefully, they won't get tired of students dropping into their studio, only ten short minutes away, to watch their dream be transformed from a small clay model into an impressive work of art. And yes, in case you forgot how this relationship started, their son Ian is considering attending Purdue University, but remains undecided about what degree to pursue and his participation in AFROTC. Our first encounter with the "BLOCK P" project was with Colonel Michael Silver of the Purdue University Reserve Officers' Training Corps Program. Our son Ian is a high school senior and is entertaining the idea of attending Purdue and joining the ROTC Program. During our conversation with Colonel Silver, our background included the fact that we were sculptors. This sparked an idea of working with the student committee that was advocating for the "Block P" project. We had the pleasure of meeting with the members of the student committee in October, when they shared their vision of the project with us. We were so amazed at the level of maturity and professionalism the students had, but what impressed us the most was their passion for what they wanted to achieve. When we started talking to them about the bronze medium and all that it entails, we could see in their faces what a "monumental" undertaking they were in for. However, the more we all talked about their ideas, the more we as sculptors wanted to help make this happen. When all the facts about the project were laid on the table, such as creative concept, completion timelines and most importantly, finances, it seemed as though it would take a miracle to see the project completed. The student committee wanted to work with the concept of the "Unfinished P", so brainstorming was involved in creating an image that would convey their thoughts. The initial deadline was to be at the students' May commencement. This would be difficult, but not impossible, given the fact that we produce our own bronzes. Unfortunately, as far as finances, the committee was starting with an extremely low budget for what they conceivably wanted to do, so there was definitely work to be done. With all of the fundamental information in place and the plan of attack laid out, the students set out to tackle the obstacles needed to get the project started. They have spent countless hours orchestrating fundraising efforts and attending administrative meetings in order to gain the University's approval to allow them to place their sculpture on campus. They had sold us on their vision. Rick and I talked and we decided to lend a helping hand in leaving such admirable tribute for ALL of the students of the university. We have been very fortunate over the years and we feel that this is our way to give something back. We were not able to donate to the project financially, but we are able to donate our knowledge, skills and time so that the budget the committee would have to work with would not have to be an astronomical amount. Also, with our open door policy, we would be able to let the students actually "experience" their project being constructed. We, as artists, are very unique. We are not only the sculptors, but we actually produce our own artwork. Over the years we have learned, that, as artists, you are at the mercy of the foundry. We do not like the fact of "not" having complete control over the production of our artwork; therefore, we have groomed ourselves accordingly. We have spent years learning every aspect of the foundry production. We have personally produced over 100 of our own bronzes. Our sculptures have been shipped internationally and have been received by both prominent public and private collectors. We have gained an incredible amount of knowledge about the casting process as a whole. We feel that the "Block P" project has enabled us to give something special to not only the students of this committee, but the Purdue community as a whole. Something that might not be understood by some is what the opportunity to be creative is to an artist. When you start with a very honorable idea, add the passion for what it stands for, and have a phenomenal group of students to work with, it makes you want to be a part of creating something that will be a legacy. With that being said, we would like to take this opportunity to thank this wonderful group of students for allowing us the privilege of being a part of their vision.